For the Friday night-owls out there, here’s what Air Force fans need to know about this week’s Mountain West Conference showdown. Gambling is illegal in most states: Air Force is a 22-point favorite. Must-win? The Falcons need one victory to secure bowl eligibility. If it doesn’t come this week, it’ll need to come Nov. 24 on the road against Fresno State (8-3, 6-1 MWC). The Falcons will not be three-touchdown favorites against Fresno State, which likely would be playing for a share of the conference title. Scouting the Warriors: Hawaii’s winless on the mainland this season and has allowed at least 42 points in every road game, including a 45-10 drubbing at Fresno State on Nov. 3. Boise State traveled to the island last week and reeled off 42 unanswered points in a 49-14 win. Hawaii ranks 119th out of 120 Football Bowl Subdivision teams in scoring defense, allowing 43.3 points per game. The offense hasn’t been much better, ranking 117th in yards per game (295.2). That about covers it: Hawaii’s starting punt returner, sophomore Scott Harding, served as the team’s starting punter for the first three games while regular starter Alex Dunnachie served a suspension. He averaged 34.7 yards a kick. Who needs a punter? 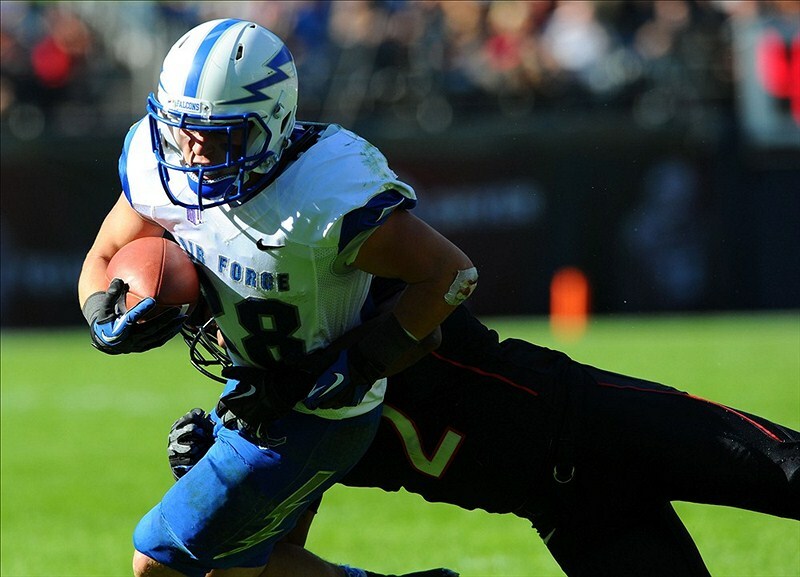 Air Force coach Troy Calhoun discusses his love of fourth-down conversions here. Last week against San Diego State, the Falcons went for it on fourth down twice in the second quarter, failing both times. A breakout senior day: Twenty-two seniors will play their last game at Falcon Stadium under the Friday-night lights, and three of them have been the driving force of the Falcons’ running attack — quarterback Connor Dietz and running backs Wes Cobb and Cody Getz. With a weak defensive foe, expect the Falcons to keep it on the ground. They haven’t had a 100-yard rusher since Cobb went for 152 against Nevada on Oct. 26; that should change this week. Odds and ends: The Denver Post looks at sophomore linebackers Joey Nichol and Jared Jones. … Despite their recent slide, football guru Phil Steele still puts the Falcons in the Bell Helicopter Armed Forces Bowl, as do the folks at ESPN. … The teams haven’t played since 2001, but they do have an official rivalry — the Kuter Trophy, named after Gen. Laurence Kuter, goes to the winner. Hawaii holds the award after defeating Air Force 52-30 in Honolulu 11 years ago.